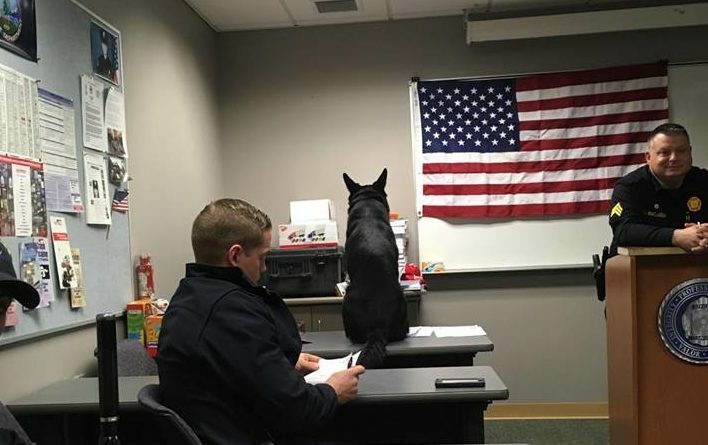 Roll call is a special time at the Bangor Police Department. We gather together to get the Sergeant’s blessing, updates on cases, patrol beats, wanted persons, and generally get into a mindset to take on the day (or night) tasks at hand. The DOJ wasn’t there. He is in a glass box after all. When Aki is working he shows up early, appears to hold a pre-game session with those who also choose to arrive early, but he knows the drill and does pay attention once the Sarge starts talking. He used to sit in a chair near the front of the room, but we have new folks and, naturally, he gave up his chair for the rookies; the table works well. He’d probably rather be perched on the lectern. He thinks he looks like Batman. You tell him he doesn’t. When I walk by ongoing roll calls in the late afternoon while leaving work, this is the picture I see, typically. I have been determined to stop and take a photo but I don’t want to interrupt the Chief. I want to thank Officers Aaron Brooker, Jordan Perry, and Jimmy Hassard for sending me their shots. Well, I want to thank Aaron and Jordan as Jimmy didn’t send me his photo. Jimmy wants me to sign a release. We hope you have a wonderful Thursday. Call us if you need police aid or intervention. BPD Duck of Justice is occasionally published in BDN Maine Weekly on Thursdays. This installment is for Jan. 17.